Rotary piles have the ability to: quickly change coring or digging tools and auger type. Bored rotary piles also have the advantage of having the reinforcement cage installed into the open bore and so can accommodate full-length reinforcement.Primarily used for large public, commercial and industrial developments as well as transport infrastructure projects, we are one of the largest contractors in this field. We have specialist expertise in delivering large, complex and technically challenging projects. 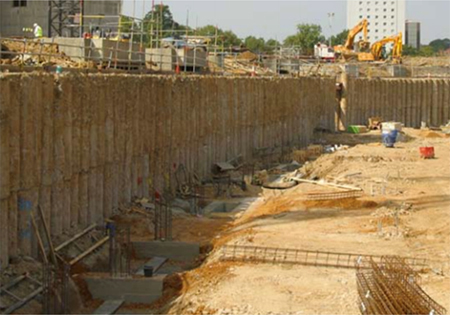 In addition to the basic technique we utilise specialist adaptations to suit certain ground conditions or site requirements; top down construction which enables above ground building to commence at the same time as the basement levels to reduce the programme; under reams for very high loads and drilling fluids such as bentonite and vinyl polymer, where the bore requires support during excavation. Rotary Bored piles can support floor slabs or loads from embankments etc. the connection would traditionally be made through a pile cap or network of ground beams. This innovative approach can save considerably on slab reinforcement and the cost/time involved in trimming pile heads.